Not unexpectedly, and with customary flair, Didion ignores the traditional features of Miami, looks briefly at tense race relations, white flight, and a saturated real-estate market, and concentrates on a kind of second city, the community of Cuban exiles who have prospered even as they pursue la lucha, the straggle. This is, of course, the kind of scene she favors: political intrigue and moral issues dominate conversations, and young girls celebrate their birthdays dressed in tiaras and fur-trimmed capes. Although her focus is idiosyncratically selective and at times her flinty, mannered style nearly parodies itself ("Hot dogs were passed, and Coca-cola spilled"), overall she is in control of this consistently engrossing material. In the 60's, Cuban refugees took the unskilled jobs that might have been offered to blacks. Many also worked (without formal government acknowledgement) for the CIA, fueled by a series of apparently intentional deceptions about policy. Exile was--is--"the organizing principle" of their lives, and the men of the 2506 Brigade (the unsupported invasion force) remain grand heroes. "I would say that John F. Kennedy is still the number two most hated man in Miami," a failed mayoral candidate volunteers, and Didion emphasizes reports linking exiles to the assassination (and reminds of Cuban involvement in Watergate and the Iran/contra tangles). Nowadays many of these men are wealthy and powerful, highly visible within the exile community, often unknown to non-Cuban citizens. Much of this information comes from conventional sources: the Herald, passionate loyalists, a university study. But this Miami is no "rich and wicked pastel boomtown," as the semi-official image would have it. 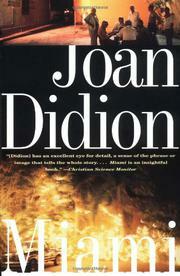 Didion presents a more complex and genuinely dramatic situation, inflecting her work with astute observations about the city's unique political circumstances and lingering on the kinds of details that have colored her other writings: a hotel offering "guerrilla discounts," a gun shop advertising Father's Day specials, house blessed with "Unusual Security and Ready Access to the Ocean." Another presistently stylish report that, with its JFK references and drug-runner allusions, has even more outreach than usual.